Whether you are on your honeymoon or simply celebrating the love between you and your partner, you can choose the accommodation that will help you create a magnificent atmosphere. As the views and activities have an important role in our life, you will never forget spending your time in a great hotel, in a romantic atmonsphere. 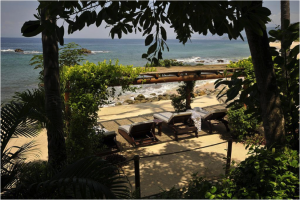 Today, we’ll be going to find out which are the best 10 Romantic Hotels in Puerto Vallarta. 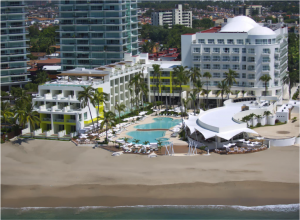 Rated by tourists as being the best romantic hotel in Puerto Vallarta, Hyatt Ziva is a natural open-air paradise, with amazing pools and great views to the ocean. You will be having the opportunity to taste great dishes from Mexico’s traditional cuisine. The hotel is perfect for its spacious rooms, with thick walls that will offer you an intimate experience with your partner. The best part about it is that you can choose an all-inclusive program that will surely make you feel special and you will provided with everything needed during your stay. Situated in Banderas Bay, this fancy hotel is surrounded by the Sierra Madre mountains and it has a wonderful beach in front of it. Fiesta Americana provides its customers with high-quality spa services, such as massages, facials sauna and steams rooms. Moreover, the hotel has an outdoor pool that is always warm and spacious. The best part about this hotel is that it has a special infinity pool only for adults, so you can enjoy your time together, without being distracted by some noisy kids. You will be surprised while tasting some premium meals such as lobster, fine cuts, prawns and expensive wines. 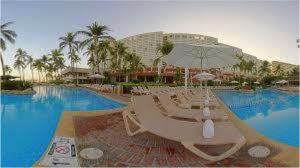 With a great view directly to both the Pacific Ocean and the center of the city, the hotel impresses with 3 awesome pools, one exterior hot tub, and a huge activity place, specially made for couples. Besides that, there’s also an adult-only terrace with 2 hot tubs and a heated pool, where you can spend some time with your partner, away from all the noise. The rooms are decorated in order to maintain a warm atmosphere, and they have multiple features such as flat-screen TVs, modern and expensive furniture, luxurious amenities and outdoor hot tubs (for premium rooms). A private chef will take care of all your culinary needs and a 24-hours opened restaurant. For the adults only, there is a large amount of bottles of wine you can choose from, included in the initial price. 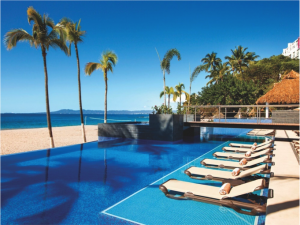 Situated on a private beach which offers great views to the Pacific Oceans is the perfect place for a family or for couples, the staff providing them with first-class amenities and services and a large variety of activities. 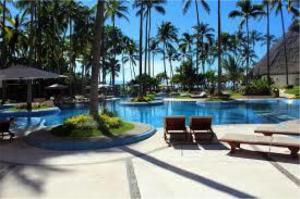 The Westin Resort and Spa Puerto Vallarta will surely make you remember the trip for a long time, because of the services and features offered: you can relax while having a beachside massage, or simply enjoy a great meal at one of the restaurants of the property. Being situated in a proper place, you have the chance to be near to some popular tourist attractions and take part in multiple activities: start your day with some watersports, go shopping, visit some art galleries or explore the wildlife. Being recognized for its special beauty treatments and spa, Sheraton Buganvilias Resort & Convention Center is the perfect place to go to if you need a peaceful holiday away from all the problems from your daily life. Providing its clients with delicious meals and ocean incredible views, the hotel represents the perfect place to escape from this season. Each room is equipped with multiple features that are meant to improve your stay: every room has a 32-inches TV, a large balcony. Additionally, you have the opportunity of taking tennis lessons on one of the tennis courts provided by the hotel. The best part about it is that you can choose from the menu, which type of food is most suitable for you: you can choose from European meals, Mexican traditional food, and tasteful cocktails. This hotel, situated in Playa Caballo has an awesome swimming pool, a huge spa with great services and healing treatments, yoga and Pilates session and private access to a deserted beach. The hotel impresses with its views to both the jungle and the ocean and the hotel provides also small boats with drivers that can show you the surroundings. The hotel provides its customers with authentic Mexican dishes using fresh vegetables and bio products that come directly from some local farmers. Located just at a few steps from 2 shopping centers the hotel offers magnificence views of the mountains, being the perfect place for a couple. The hotel offers a large number of features that will make from your holiday an unforgettable one: ever room features modern décor, a flat-screen TV and a balcony where you have the chance to admire the Pacific Ocean. The best part about it is the big fitness center that will help you stay fit and get rid of some kilo if needed. Situated near the city’s center, Crown Paradise Golden [provides its customers with great services and luxurious accommodation in order to make your holiday memorable. The best part about it is that by staying at6 this hotel, you can never get bored. You have plenty of activities you can choose from, starting from different watersports and pools to dance courses during the night. This hotel has entertainment moments for all the tastes. The customers will be served with traditional Mexican food in a farm-to-table restaurant that is on the hotel’s property. 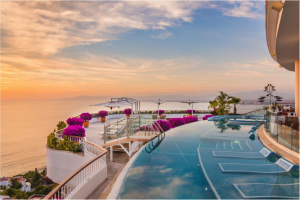 Situated at 24km away from Cruise Ship Pier, Villa Armonia Luxury Boutique Hotel could be found in Tomato, a district from Puerto Vallarta. The property has a lot of features in order to help the clients to have a great holiday while staying here. You will have the opportunity to taste some great French tradi5tional food directly from the restaurant’s cuisine and also have some incredible views. This hotel was designed especially for both single and in a relationship people. The kids are no longer accepted here so you can be sure that you will have a peaceful experience by staying here. Located at 6km from Cruised Ship Pier the hotel represents the best place where you can go and spend some high-quality time. There are also a lot of features that will make your trip better. 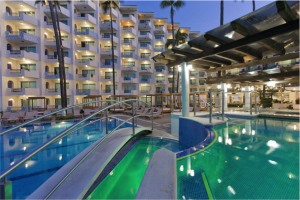 As you can see, there are plenty of hotels where you can stay in Puerto Vallarta in order to have a memorable trip. However, there are also other alternatives when it comes about celebrating your love, but a hotel that has already got the necessary atmosphere is the best choice. Few travel to Puerto Vallarta knowing that there is a lush green jungle lining the crystal blue oceans that is just as fun to explore as the deep blue sea. Those who do, however, get to experience hiking, waterfalls and the Sierra Madre Mountains at their finest. It is essential to have an idea of the area you are going hiking. This is the first step to that seamless hiking adventure you yearn. Find out information on the area. Ask yourself these questions; Do you know how the terrain you are going to hike in looks .like? How is the weather situation n the area? Are there bugs? When going on a hike, avoid carrying unnecessary clothes. Instead, pack attire that will be useful for you during your hike. 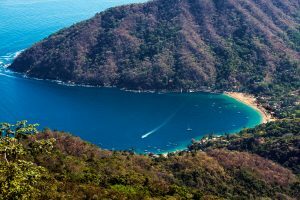 In Puerto Vallarta the air is hot & humid so wear light hiking clothes, bring a change of underwear, a swim suit, good shoes and extra socks. This is a packing method I feel every person intending to hike should use. It is where you start by packing your sizable amenities first at the bottom and then pack the essentials close to the top. Do not be in a situation where you try fitting all your heavy stuff at the top and your clothes at the bottom; You will have to empty the bag if you want to change your shirt. It is advisable to itemize the belonging you would wish to carry based on their capacity to fold. The more natural an item can fold the better. This will ensure that it is easily transportable when not in use. You can also look for items that have several uses to save some much-needed space. And don’t forget the camera. Realize from the beginning that your priority is the adventure. This will go a long way in shaping your decisions on what to carry. Just know that efficient packing equals efficient hiking. Once you blunder during packing, you are most likely going to have a not-so-pleasant hike. 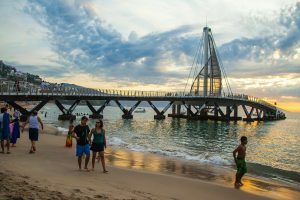 It’s a hot day in Puerto Vallarta, you’ve been exploring the area and appreciating its beauty, or maybe you’ve just been doing all sorts of fun stuff that PV offers. You’re done for the day and are looking for a place to relax with your mates and have some craft beer. And we all know beer tastes better on a full stomach. So you also want a place that you can grab a bite and have beer at the same time. Here in PV, we have you covered. Here are some famous spots where you’ll find the best craft beers & local bites all in one. 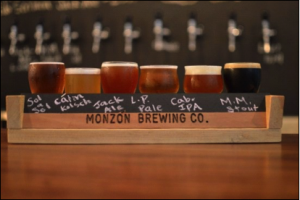 Monzon Brewery is one of such establishments. This famous brewery, located in the popular romantic zone, is ideal for chilling with friends or your loved one while sipping on some delicious beer crafted with innovation and enterprise. The beer that is crafted to bring out that unique taste that sets it apart from all the others. In addition to beer, the establishment also offers its customers a wide array of foods in their menu. There are some tapas bites provided every day from 3 to 5 pm at pocket-friendly prices. The bites include Jalapeño Bottle Caps, Chicken or Chorizo Taco, Chips and Bean Dip, Salmon Tostada and Cheesy Garlic Bread with the amount ranging from $20 to $30. 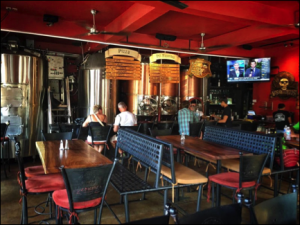 Los Muertos Puerto Vallarta brewery is another exciting craft beer joint in the area. The establishment offers eight different types of craft beer, an ideal place for people in various regions of the world. If you are in Conchas Chinas or the romantic zone then Los Muerto is just a few minutes away. In addition to the beer, they also offer a wide variety of food to chose from. They also provide some light plates that include chicken tenders, chicken wings, and french fries. What’s even better is the fact that their happy hour is every day from 4 to 6. So, when you visit Puerto Vallarta, do not hesitate to go and experience all that it has to offer. Try some unique beers from these local pubs and who knows, and it might end up being the best decision you ever made. PV is a place you visit where your art desires will be fulfilled. 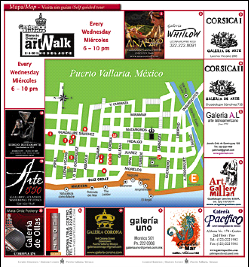 And what better way than to be part of Puerto Vallarta’s Artwalk every Wednesday night in Downtown. This is where you go if you want to relieve ancient Mexico through art. Artists from Mexico renowned from all over the world carefully and skillfully created pieces that take you back in time while still being in tune with the modern world. This art gallery which was started three years ago is one of Puerto Vallarta’s preferred stop for jewelry enthusiasts. The gallery displays hand made, quality and authentic jewelry pieces that have been curved from high-quality stones. If you wish to view pieces collected from around the world, then this is where you should be on Wednesday while in Puerto Vallarta. The artwork displayed has been carefully selected by Jean Pierre Renucci, a renowned international collector and curator. Need to find art pieces and artifacts for your home or office in an artistic and modern way? Then you have to visit the ManMade Mexico modern design gallery. The gallery features perfectly designed pieces perfect for decorating your spaces. This is one of the galleries that have been active in Puerto Vallarta for the longest time now. Since 1987, the gallery has continuously displayed beautiful contemporary art pieces and sculptures from various artists. The gallery has been a source of inspiration for various artists including Ramiz Barquet. Are you fun of or a collector of antiques and vintages? Then this is the gallery for you. The gallery features a diverse portfolio of the antique and vintage jewelry, ceramics and also textiles. Appreciate the skills the men and women of ancient Mexico had. This award-winning PV gallery showcases artworks from several artists. It has managed to survive the test of time by being around Puerto Vallarta for over 43 years. And throughout this time, the gallery has displayed art from several artists living and working n Mexico. In 1971 the quest of a 15-year-old boy Juan Quezada, who by then was already 30 years, to recreate ancient pottery making process was complete. Fast forward to 1998 when Galería de Ollas was established to display some of the works of people who were beneficiaries of the knowledge passed down from Juan Quezada. The pottery displayed are hand made, beautiful and unique and are an indication of what ancient Mexico Pottery looked like. 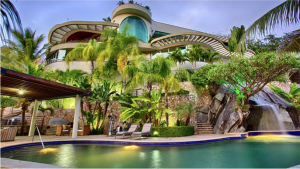 There are several other galleries in Puerto Vallarta including the LOD where you find jewelry and The Loft Galeria which features contemporary and modern art pieces from the world over. Artists are unique, and this is evident from the art pieces they create. It’s true you will never see enough art. 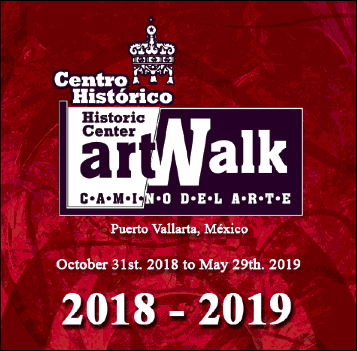 So head on to Puerto Vallarta’s Artwalk every Wednesday night in Downtown. We all know that Puerto Vallarta is an amazing destination you can go to whenever you need to relax; There are hundreds of activities you can take part in! If you find yourself in Malecon and you need something refreshing and tasteful, then don’t hesitate to stop and buy an ice-cream from Nanitos. There is a large variety of flavors you can choose from, specially made for all the tastes. Besides that, there are also some recipes made for those who are lactose intolerant or even for diabetics. They have great options for everyone. The tourists have said that the best flavor is guayaba so give it a try: it will never let you down. 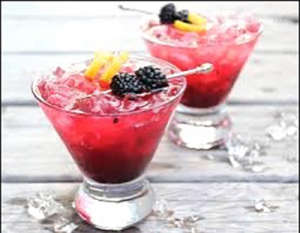 If you find yourself tired at the end of the day, then the perfect way to get a bit more relaxed is by enjoying a perfectly-made cocktail that is made with your favorite ingredients. At Bar Oceano everything is possible. You have a large range of cocktails you can choose from, no matter if you’re an alcohol fan or not. There are options for all the tastes and you can even create your own recipe from the ingredients you like the most. So what are you waiting for? Enjoy a beautiful sunset while drinking one of the best cocktails in the entire Puerto Vallarta. You have probably heard that tequila is one of the most consumed drinks in all of Mexico. In order to popularize this amazing drink, the locals organize special tequila tasting sessions, so the tourists will eventually find out more information about this incredible drink. In this way, you will have the opportunity to taste it right at its home. You will improve your knowledge about the way it’s prepared and you will finally know to make difference from the variety of assortments. If you want to find out more information about this region’s history or you just simply want to admire some amazing sculptures, then this tour is the perfect choice for you. The La Conner Arts Commission organizes each year an exhibition with a large number of sculptures carefully selected. In that part of the year, there are hundreds of walking tours organized there in order to convince the tourists to buy some great pieces of art. If you want a break from visiting the Malecon, then try getting a meal at Florios, a great and popular restaurant situated in the center of this region. With a large range of meals you can choose from, you will be amazed to see the professionalism the staff of this restaurant proves. The ever-popular chimichurri comes highly recommended. Besides that, while eating here you can also listen to some great live music and enjoy the 2 for 1 offer available every Tuesday and Wednesday. There are a lot of things that can be done in Puerto Vallarta. However, Malecon is very popular because of its unique possibilities for tourists who come to visit it. 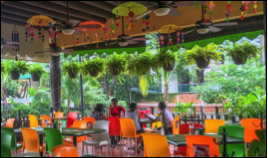 Considered as being one of the funniest restaurants in Puerto Vallarta, Fredys Tucan is the perfect place where you can get the lunch with your family. From banana pancakes to supreme omelets, every kind of food is cooked using fresh aliments that come from safe sources. Although this restaurant is always full, the staff has learned how to manage a large number of clients. As a result, his restaurant is appreciated by its customers because of the waiters’ speed that bring you the food in a really short time. 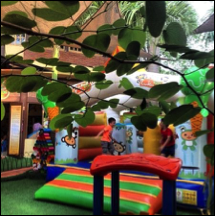 Inside the restaurant, there is a peaceful atmosphere and there are lots of surprises for kids. Lukumbe restaurant is considered as being a heaven for all the young parents who have small kids that they have to be very careful with. The staff would surely look after your children while you’re serving the food (for a small tip) so you’ll finally have the chance to eat in peace, while your kids are in a safe place. Besides that, there’s an amazing indoor playground area for the kids to spend some time until the order comes. Here, they benefit from an inflatable bouncy and there is no fee for using it. The restaurant provides mothers with baby changing facilities and a toy room for older children. 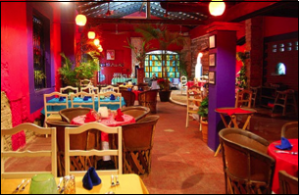 Rated as an excellent restaurant which provides its clients with fresh, authentic flavors and a friendly atmosphere offers hundreds of different meals but the most recommended one are the Mexican traditional meals that are served at really low prices. There is one thing that makes this restaurant perfect for families who want to take the dinner outside their house: there is always great live music during the night that creates a great atmosphere you will surely fall in love with. 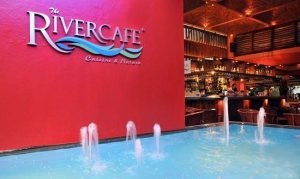 Situated in the historic center of Puerto Vallarta, this café/restaurant is hidden among the lush tropical foliage. For the kids who come here, there are special meals that include both Mexican and American meals in order to satisfy all their needs. This place is located in a tranquil spot so you would have the chance to eat your meal in a quiet place away from the town’s noise. Most of the restaurants from Puerto Vallarta are children-friendly so do not be worried that your kids would be not accepted inside. Just ask the waiter and see if the restaurant has different facilities for kids and wait for a response. You’ll be amazed to see how much the locals love kids. Puerto Vallarta is situated near the Pacific Ocean, with its impressibly beautiful beaches and amazing colors of the ocean. While visiting the town, don’t forget to write on your bucket list at least 5 beaches that must see while you’re here. Where are the most beautiful beaches in the entire region? Although it might have a frightening name, Playa Los Muertos (the Beach of the Dead) is one of the most appreciated beaches for its views and characteristics. Situated very close to the central square, the beach has had this name since it was used as a cemetery. However, in spite of its weird name, the beach is now good for beach volleyball, watersports and the perfect place for a family who wants to spend their time together. Even though there are hundreds of beaches you can go to inside Puerto Vallarta, make sure you do not forget to visit this one. Located in a tranquil spot, just a 10-km drive from the center of Puerto Vallarta, this beach is perfect for those who want to spend their time in a quiet place and relax while listening to the sea waves. Although this beach is very popular, there are not hundreds of people who visit it daily as is common for other beaches. 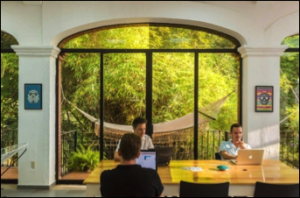 Boca de Tomatlan is recognized for being a quiet place where you only come in order to charge your batteries before going to work again. If you’re getting hungry, do not forget to try some Tacos from the stands set near the beach… they’re incredible tasteful and cheap. 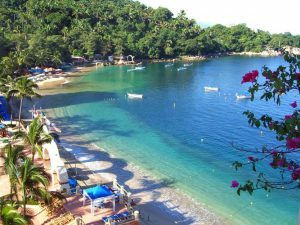 Being one of the most beautiful and authentic beaches, Playa Yalapa has been isolated from the rest of the region in a charming village where tourists barely come. Due to the lack of paved roads that connects the beach with the main roads from Puerto Vallarta, this place can only be accessed by boat. This is what makes it special and attracts the adventurers to rent a small boat and sail here. 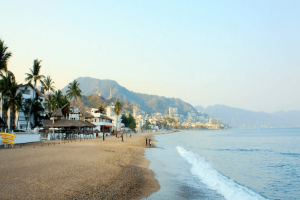 Situated in the center of Puerto Vallarta’s hotel zone, Playa Playa Camarones is a quiet small place perfect for families who come here in order to have some fun on a wonderful beach. If you want to do some swimming or build some sandcastles, then this beach is the perfect choice for you. 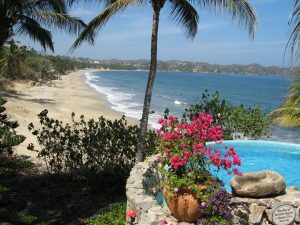 Playa Camarones is very popular for its activities such as watersports and different excursions in the Ocean. You can do some parasailing, take a banana boat excursion or rent a small boat and drive along the beach. If you love watersports and you’re addicted to surfing, then this place is perfect for you. Beloved by all the surfers, this small beach is situated in the Centre of a small town in Puerto Vallarta. With lots of restaurants and friendly people that are always ready to give you a piece of advice, this place would surely introduce you to a great atmosphere you would never like to get out from. For those who want to try surfing for the first time, there are places where the water it has the perfect size for them to start learning about balance and movements. 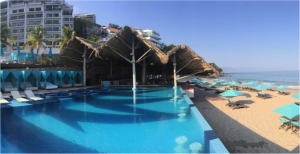 Puerto Vallarta is the perfect place when it comes about lying on a beach being surrounded by incredible views and sounds. As there are hundreds of beaches you can visityou will never get bored when visitng this magnificent region. Who says that a person on a budget should remain cant travel far and wide? That they should not travel? In Puerto Vallarta, you do not need to use expensive means of transport to see all of the beauty the city has to offer! Using a bus is the cheapest and most efficient way to get around PV. The municipal bus system connects almost every neighborhood, and there are also buses that can transport you from one region to the other. The city buses will draw you back roughly $10 pesos, and most are still operational at night. 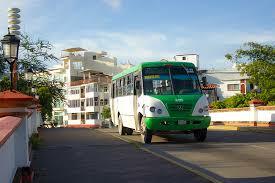 You can use buses from the moment you step foot in PV as they are also found at the airport. 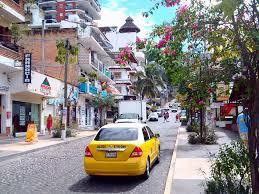 The taxi business has been operational in Puerto Vallarta to date. The signature yellow taxis have rates published, and you should be charged by car. If the driver charges per person, ignore them and move on to the next one. If you are on a budget, avoid the luxurious type taxis as they are bound to charge more. If you have an Uber app on your phone and you can use it at that particular time, it’s even better. Though the yellow taxi price is reasonable, Uber is cheaper. There are some funded city tours in Puerto Vallarta. An example is a promotional tour; The CityFunTastic tour. You get to visit the areas in Puerto Vallarta that seem to expose you to and promote the Mexican culture. For renting a car, it is advisable that you consider it when you are traveling with a couple of friends. 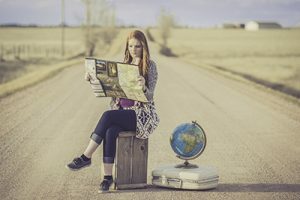 If you want to travel on a budget but at the same time desire flexibility, you can plan a vacation with friends who are willing to share the cost. The more people you are with, the cheaper it will be to get a rental car. Experience the city while walking or riding a bike. It’s an excellent and healthy way to experience PV. Some of the areas in the city have bike lanes which make the idea even more welcoming. You don’t need a lot of money to travel in Puerto Vallarta. You only need to know of the alternative means of transport. And we have already outlined them for you. 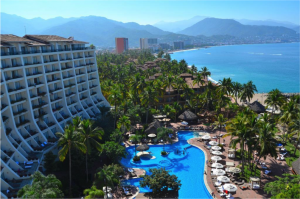 Read on for more travel news and information on Puerto Vallarta. Check the first part clicking here! If you have never seen a Humpback whale, then you need to visit PV and see them up close. The whales are regulars in the Bay of Banderas, and they are around from December all the way to March. Have you heard of the Marietta’s Islands? These are a group of uninhabited islands under the protection of the Mexican government. Experience unmatched beauty while enjoying the warm waters surrounding the islands. While there, you can engage in fun activities like snorkeling, scuba diving or you can even decide to visit the hidden beach. Experience the local culture first hand by visiting the Malecon area. The Malecon area is the ideal location of a stroll along the famous seaside promenande. There you get to admire sculptures. Do not pass on the chance to experience Mexican culture on display around the area. Performers are dancing n the main square, vendors and the sea offers you a taste of its might with the waves lapping the shore nearby. For marine life enthusiasts, this is for you. Visit the Los Arcos National Marine Park for a fun-filled day. You can engage in different fun activities like snorkeling, swimming, and enjoying time on the water. For those interested, there is also Zip lining and horseback riding offered. You can also decide just to lay back and spend the day on a beach. After a long fun day, you will want to let off some steam. There is no better way to do this than by visiting the Marina Vallarta. While there, you get to see several beautiful boats parked in there and enjoy the sunset the Puerto Vallarta style; with a view of the ocean. Do not visit Puerto Vallarta and come out having no story to tell. Instead, look for exciting and unique activities to the area that you engage in and remember for the rest of your life.